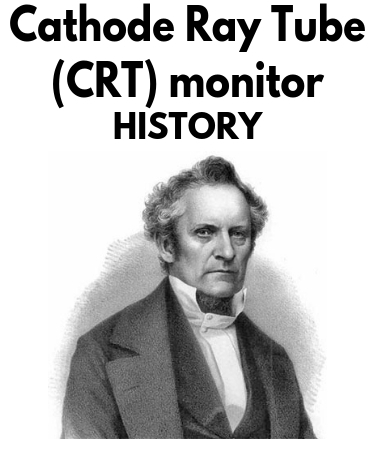 The history of Cathode Ray Tube can be followed back to (at least) 1854, when the skilled German glassblower and mechanic Heinrich Geissler (Geißler) (1814-1879) was asked by the professor of mathematics and physics in Universität Bonn (University of Bonn) Julius Plücker (1801-1868) to design an apparatus for evacuating a glass tube. Johann Heinrich Wilhelm Geißler (see the lower photo), born in Igelshieb, Thuringen, descended from a long line of craftsmen in the Thüringer Wald and in Böhmen. 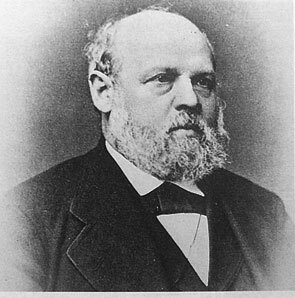 He worked for years through Germany and the Netherlands as an instrument maker (together with his brothers, also glassblowers), eventually including the University of Bonn, where he finally settled down in 1852 in a workshop of his own, as an instrument-maker for the production of Physical and Chemical instruments. In 1855 Geissler was rewarded with the gold medal on the Exposition Universelle (World Exhibition) in Paris due to his excellent work on fine glass. Julius Plücker was a famous German mathematician, who made fundamental contributions to analytic and projective geometry, but in 1840s he turned away from mathematics and concentrated on physics. In 1847 he began research on the behavior of crystals in a magnetic field, establishing results central to a deeper knowledge of magnetic phenomena. The order of the apparatus for evacuating a glass tube to Geißler was made in relation with similar research—to concentrate the light for his spectral research. Geißler was interested in these tubes from the experiments of his brother Friedrich in the Netherlands. Friedrich Geißler had made earlier these massonic tubes (filled with mercury vapor) in Amsterdam for the Dutch Chemists Volkert Simon Maarten van der Willigen. So in 1855 Heinrich Geissler developed a hand-crank mercury pump (with this pump he was able to reach very low pressure levels) and glass tubes that could contain a superior vacuum (the Geißler Tube), a low pressure gas-discharge tube made of glass. Plücker owed his forthcoming success in the electric discharge experiments (Plücker inserted metal plates into the Geissler tube and noticed a pale green light at the positive end of the tube, and in 1858 shows that cathode rays bend under the influence of a magnet suggesting that they are connected in some way) in large measure to Geissler. The future value of Plücker and Geissler's research toy, apart from neon lighting, would be fully realized only some 50 years later, in 1897, when Karl Ferdinand Braun introduced a CRT with a fluorescent screen, known as the cathode ray oscilloscope, and in 1905, when Lee De Forest invented the Audion vacuum tube, creating the entire basis of long-distance wireless radio communications and electronics. But it was a long way to go to Braun and De Forest. Geissler's tubes went soon to other countries like France and England, to researchers like Faraday, Crookes and Hittorf which he sent 50 tubes for research in 1858, the many experiments which followed led to many new discoveries. In 1865 the German chemist Hermann Sprengel improves the Geissler vacuum pump. In 1869 the German physicist Johann Wilhelm Hittorf finds that a solid body put in front of the cathode cuts off the glow from the walls of the tube and establishes that rays from the cathode travel in straight lines. In 1871 the English engineer Cromwell Fleetwood Varley published a suggestion that cathode rays are composed of particles. William Crookes proposes that they are molecules that have picked up a negative charge from the cathode and are repelled by it. In 1876 the German physicist Eugen Goldstein shows that the radiation in a vacuum tube produced when an electric current is forced through the tube starts at the cathode and introduced the term cathode ray to describe the light emitted. Later in 1876 Goldstein observes that a cathode-ray tube produces, in addition to the cathode ray, radiation that travels in the opposite direction. These rays are called canal rays because of holes (canals) bored in the cathode; later these will be found to be ions that have had electrons stripped in producing the cathode ray. In 1883 Heinrich Hertz shows that cathode rays are not deflected by electrically charged metal plates, which would seem to indicate (incorrectly) that cathode rays cannot be charged particles. Later in 1892 he concluded (incorrectly) that cathode rays must be some form of wave, shows that the rays can penetrate thin foils of metal, which he takes to support the wave hypothesis. The above-mentioned and many other discoveries led to the 1897 invention of the famous German physicist Karl Ferdinand Braun (who played also an important role in developing of semiconductor devices), when he built the first cathode-ray tube (CRT) and cathode ray tube oscilloscope (see the upper image). Braun shared the Nobel Prize for Physics in 1909 with Guglielmo Marconi for the development of wireless telegraphy. However, he is still best know for his invention of the cathode ray tube and the first oscilloscope. The development of cathode ray tube greatly facilitated the development of a practical television system. In 1907, the Russian scientist Boris Rosing (working with his student Vladimir Zworykin) used a CRT in the receiver of a television system that at the camera end made use of mirror-drum scanning. Rosing transmitted crude geometrical patterns onto the television screen and was the first inventor to do so using a CRT. In 1929 Zworykin invented the cathode-ray tube called the kinescope, sorely needed for television. It seems the first computer, which used a CRT monitor, was the US military SAGE from 1950s. SAGE had more than 150 display consoles housing a 48 inch long Vector CRT. 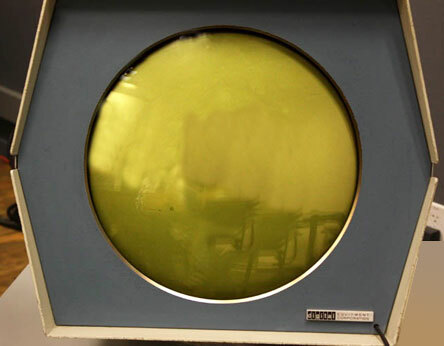 The first commercial computer equipped with a CRT monitor was Digital Equipment's PDP-1 from 1959.